Cogeneration or CHP (combined heat and power) is the process of recovering exhaust heat that is wasted when an engine runs to produce electricity or other process. 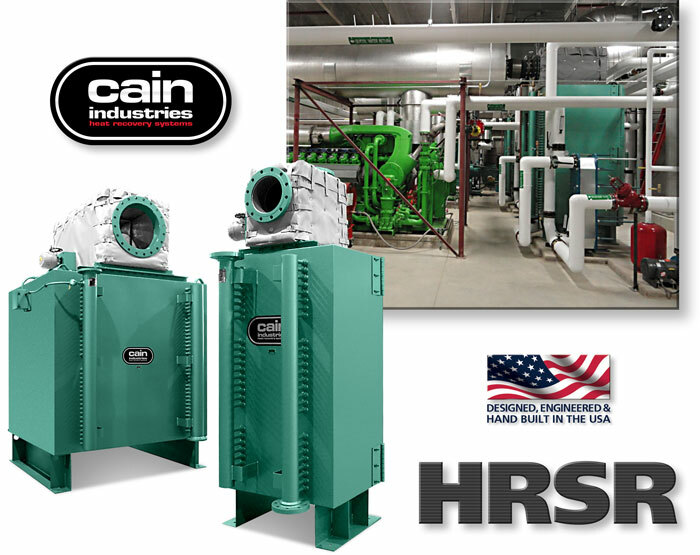 Cain Industries manufactures exhaust heat exchangers and heat recovery steam generators (HRSG) for natural gas engines, diesel engines, gasoline engines, turbines, microturbine generators and fuel cells. Captured BTUs are transferred back into a desired water, glycol, thermal fluid or steam production heat sink. Suitable fuel types for combustion sources include natural gas, propane, gasoline, biogas, digester gas, landfill gas, diesel fuel and light to heavy fuel oils. Tremendous savings result from overall system efficiency improvements when recovered energy is repurposed within the facility and processes. The fully packaged ESG1 (Exhaust Steam Generator) is selected from 124 pre-engineered standard models with output capabilities of 20 to 350 boiler hp and operating steam pressures from 3 to 400 psig. 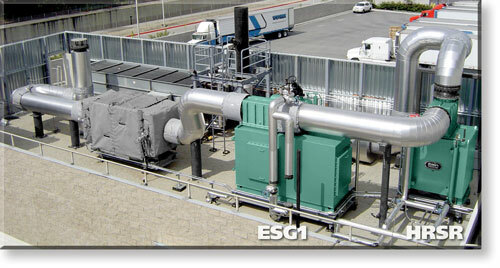 The ESG1 is shipped complete, ready for operating as either a primary or supplementary steam source. The ESG1 is manufactured, tested, and stamped in accordance with the requirements of Section I of the ASME Boiler and National Board of Boiler and Pressure Vessel Inspectors code. Boiler trim includes all safety controls and alarms to meet state and federal codes. Final assembly, electrical wiring, and factory adjustments are completed under a strict set of guidelines. Maximize boiler efficiency by periodically sampling surface blowdown water and controlling total dissolved solids. Maintaining optimal levels of concentrations will control the costs of water, energy, and chemicals. Assembly includes: motorized valve, probe, and piping assembly. Sootblowers are available either as a manual push button start or fully automatic with timed sequencing. Sootblowers are considered when firing with fuel oil and/or incomplete combustion. Sootblowers are also considered when manual cleanings are not feasible in order to maintain peak performance. The HRSR waste heat recovery silencer is a modular configuration package with 176 standard models available. It packages standard features such as: full exhaust bypass, full heating surface access, hard shell exterior, stainless interior, 3” thickness factory insulation minimum, and a variety of finned tube types and fin spacings to fit the proper application. The HRSR is designed to receive the total exhaust and liquid flow from a single source and control exit temperatures to the desired performance levels. During full operation, the radial design channels the exhaust flow through an hour glass expansion flow pattern which provides for significant dBA reduction. Operating Sequence: During a cold startup the exhaust bypass will be powered to the normal operating position. As the liquid temperature rises and approaches a preset point, the exhaust bypass damper will begin to move to the temperature control position. When the desired temperature is completely satisfied the damper actuator will move to the maximum open position, bypassing 99% of the exhaust flow (100% bypass cannot be attained due to some leakage and residual heat in contact with the fin tubing). Included is a 4-20 mA output controller, thermocouple, thermocouple weld and wire, and modulating bypass actuator installed, wired, and tested for a single 120 volt, 1ph, 60hz power connection. The UTR1 (U-Tube Recovery 1) has a compact industrial design that allows for maximum BTU recovery relative to the space allotted for installation. Finned tube spacings range from 3.5 to 6.5 fins per inch, depending on the fouling factor requirements. Standard fin to tube attachment using the nickel braze/weld fin to tube process allows no fin to tube separation to 2,000°F. The UTR1 can be located above the engine or on the floor for convenient installation. With over 170 standard configurations to choose from, the UTR1 can be designed to meet the closest approach temperature requirements when installation space is not an issue. Easy access allows for quick removal of finned tube rows or core assemblies without disturbing the exhaust gas connections and allows for routine inspections and/or cleaning requirements. 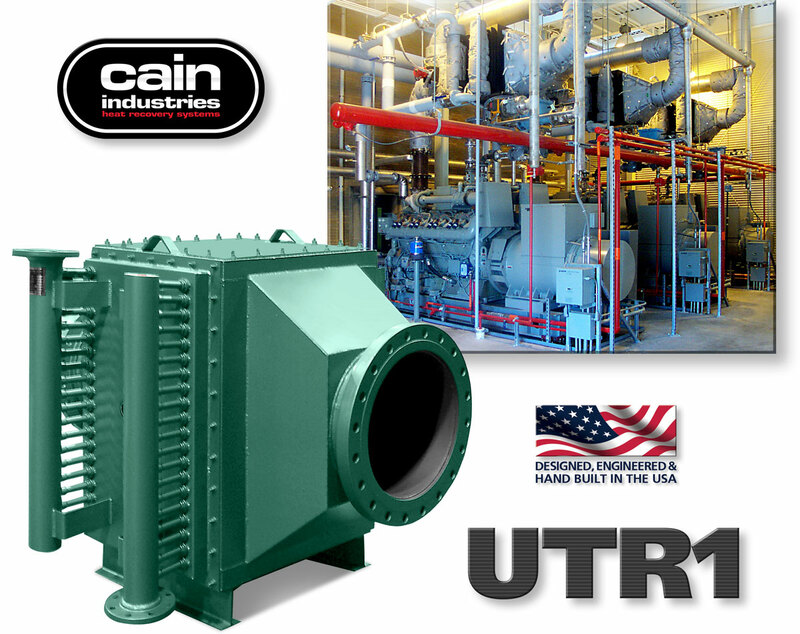 The exclusive Cain Industries Timed Automatic Sootblower design is applied to combustion sources where the sulfur content is high and/or combustion efficiency is poor. Heat transfer efficiency is significantly reduced when a soot layer accumulates on the heating surface. The sootblower is also suggested when it is not cost-effective to open inspection doors and clean the exchanger by other means. The sootblower system will continually keep the heating surface at a high performance level and eliminate the day-to-day operator expense and engine downtime. The blowdown sequence occurs while the engine is in full operation and is fully adjustable. The special flood-jet type nozzles achieve maximum cleaning velocity using steam or air as discharged through an electric control valve (included). Together they form a ”continuous knife edge concentrated spray pattern” surrounding the heating surface. This ”ring nozzle assembly” as attached to a manifolded flexible steel hose assembly, is powered up and down by a pneumatic drive cylinder. Dual timing relays allow complete control for cycle duration and intervals specific to each application. 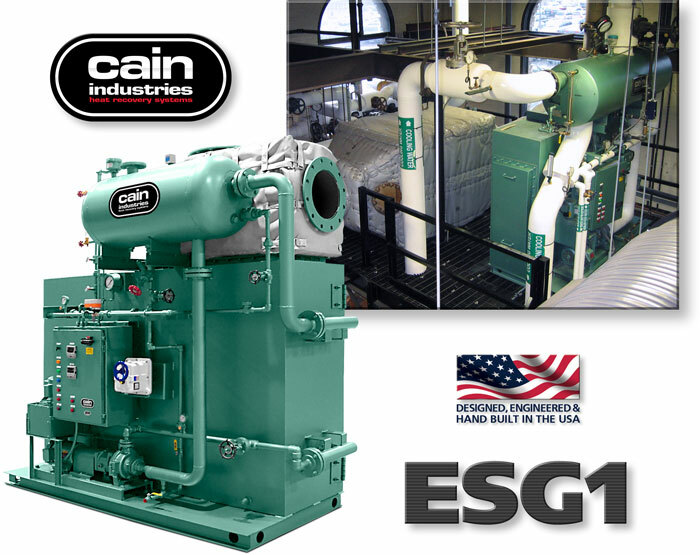 A City of Industry, CA dairy depends on a Cain Industries ESG1 Heat Recovery Steam Generator and an HRSR Heat Recovery Silencer Radial working in series to capture the exhaust heat produced from their engine generator. The roof mounted units recover almost 4,000,000 BTUs per hour. The energy is repurposed for steam demand and a water loop used in dairy production. The Cain duo save $244,964 of energy annually ($30.62 per hour) and almost $5,000,000 over the 20-year life expectancy of the equipment. Payback on both units was less than 10 months. 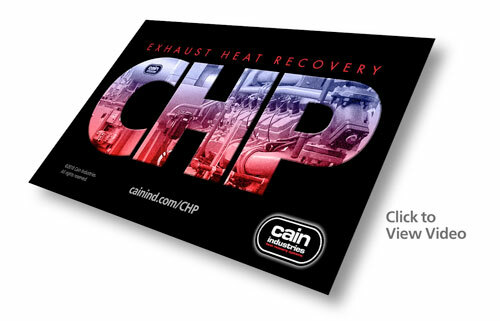 Cain Industries Releases CHP | Combined Heat and Power Exhaust Heat Recovery Video. 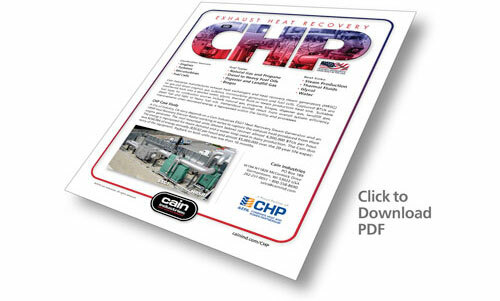 Cain Industries Releases CHP | Combined Heat and Power Summary Sheet. Click to download the PDF summary! ©2019 Cain Industries. All rights reserved.